Each morning, Maria Munoz wakes up her 2-year-old son, Robert, before dawn at 5 a.m. to leave their home in Littlerock in the Antelope Valley. They head to his speech therapy sessions 12 miles away at Palmdale Regional Medical Center. What would be a 21-minute drive by car takes Maria and Robert 2 1/2 hours on three different buses. By the time they finish his lessons and return home, it’s close to 4 p.m. and the sun is low on the horizon. The five-hour daily round-trip bus trek is taking a toll. Maria worries about interrupting her son’s sleep and having enough time in the day to make sure he practices his speech lessons at home. “Because he’s so tired and doesn’t want to practice his lessons, I’m worried he might not ever talk to me,” she said, wiping a tear from her eye. Norm Hickling, Chief Operating Officer for the Antelope Valley Transportation Authority (AVTA), was among those listening to Munoz as she shared her somber tale. Seated at a large conference table with other transportation officials and decision makers at the First 5 LA-sponsored Antelope Valley Transportation Forum, Hickling quickly responded with a solution. “We’re going to connect you to the Dial-A-Ride service to take you and your son directly to Palmdale Regional Center,” he told Munoz. But it was more than just luck at play. 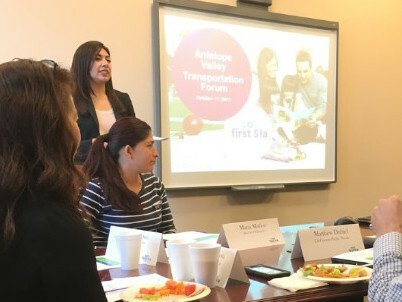 Munoz is a member of the Best Start Palmdale Community Partnership, which participated in the October transportation forum along with members of the Best Start Lancaster Community Partnership. In addition to AVTA executives, the forum brought together staff from Los Angeles County Supervisor Kathryn Barger's office, engineers from Los Angeles County Public Works and staff from the city of Palmdale — all to connect to community members and address transportation challenges for families with very young children in the Antelope Valley. Indeed, this transportation forum is among the latest examples of how First 5 LA is taking significant strides in its policy and systems change efforts, from the agency’s first-ever Policy Agenda to a partnership between Help Me Grow-LA and L.A. County to advancing developmental screenings for young children. Along with recently released reports on trauma-informed care and the trauma of child homelessness, this work illustrates how First 5 LA is collaborating as a convener and partner to advance policy and systems change in the county and beyond. At the transportation forum, Munoz’s story was accompanied by the tale of Nora Alvarez, a Best Start Lancaster Community Partnership member whose family is feeling the negative impact of her husband’s long commute on the 14 freeway. Six days a week, Alvarez’s husband rises at 3 a.m. to get to work at his construction job in the L.A. area by 7:30. He doesn’t return home until after 8 p.m., by which time his four children are often already in bed. Lancaster has been ranked as the most stressful city in California, in part due to its long commute times, which means less time for family bonding at home. Increased stress can also lead to a higher incidence of domestic violence. The Antelope Valley has been plagued by the county’s highest rates of infant mortality and child death in 2013, as well as the highest rates of families with children ages 0–5 referred for child abuse or neglect, according to a 2015 study. It came as no surprise, then, that the two Best Start communities in the Antelope Valley had made transportation a priority issue, prompting a forum to voice their concerns — not only to impact existing transportation policy today, but to build capacity to influence the design of future transportation systems that will come through L.A. County’s Measure M.
If the November 9 Commission meeting was any indication, even more change — systems change, that is — is in the air at First 5 LA. In a significant move toward the countywide effort to advance a systems approach to developmental screening and early intervention grounded in the Help Me Grow model, the Board unanimously approved a Strategic Partnership with the L.A. County Department of Public Health (LACDPH) as the organizing entity for Help Me Grow-LA. Neither a program nor a service, Help Me Grow is a national effort that builds on existing resources at the local level to strengthen how systems work together to provide timely screenings for developmental and behavioral delays, effective care coordination and appropriate referrals to ensure young children have the support they need to thrive. Prioritizing the need for developmental screenings as part of its 2015–2020 Strategic Plan, First 5 LA held a convening in May 2016 in partnership with L.A. Care Health Plan, LACDPH and the American Academy of Pediatrics (AAP) California Chapter 2 to introduce the Help Me Grow model to L.A. County stakeholders. 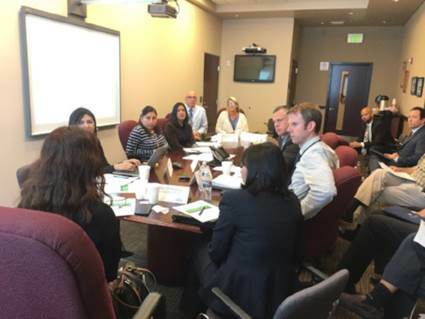 Since last September, the HMG-LA Leadership Council and workgroup members have participated in a total of 32 planning sessions and convenings. During that period, over 60 county agencies, organizations and programs across diverse disciplines and sectors (including health and early care and education) were involved in the early design and planning phase and contributed to developing recommendations for HMG-LA. Announced last month, these recommendations serve as a guide to inform the next phase of implementation planning for HMG-LA. As approved by the Board this month, the five-year Strategic Partnership with LACDPH as the organizing entity will help to guide the planning and implementation of HMG-LA. The HMG-LA organizing entity will provide support, oversight and facilitation of broad system change activities and build out the necessary foundational infrastructure. Additionally, the Organizing Entity will provide administrative and fiscal oversight necessary for long-term system sustainability. In a related move, the Board also approved a two-year extension of First 5 LA’s First Connections initiative for an amount not to exceed $1.9 million. The goal of First Connections is to address systemic barriers and reduce disparities for young children with Autism Spectrum Disorders and other developmental delays. Continuing this work will sustain the critical infrastructure and partnerships established through First Connections and maintain important community-based resources that can inform the early implementation of HMG-LA. See below for a video of First Connections at work improving the life of an L.A. County family. Family Resource Library Executive Director Yvette Baptiste, cochair of the HMG-LA community and family engagement workgroup, praised the agreement at the Board meeting. “You have fierce parent allies ready to work with you to bring about this change and increase the potential of L.A. County’s children,” Baptiste said. Speaking of innovation, the Board this month also unanimously approved a new Policy Agenda aligned with First 5 LA’s Strategic Plan. Spanning 2018–2020, the Policy Agenda’s goals will guide First 5 LA’s policy and systems change efforts across the agency’s four outcome areas: Families, Communities, ECE Systems and Health-Related Systems. First 5 LA’s previous legislative engagement process of approving a state legislative agenda in the spring of each year was reactive in that it required lawmakers and others to develop legislative solutions before First 5 LA advocated its support for a specific bill. The creation of the Policy Agenda represents a shift to a proactive approach where First 5 LA engages in policy development and advocacy activities early in every budget and legislative session. “Not only would this allow us to more proactively engage in advocacy in multiple ways — budget, regulatory and administrative, in addition to legislative — it will allow us to bring more frequent and timely information to the Board throughout the year,” First 5 LA Public Policy and Government Affairs Director Peter Barth told the Board. Moreover, the Policy Agenda will enable staff to engage key partners in Sacramento and Washington, D.C., in the fall and early in the New Year to proactively inform, guide and shape policy and relationships to enhance First 5 LA’s effectiveness in the state and nation’s capitals. Barth also pointed out a string of state legislative accomplishments supported by First 5 LA’s advocacy team and its partners that were signed into law in October. “Contribution, not attribution, is essential when assessing success because many voices play critical roles in changing minds and influencing decisions,” Barth said. In another boost for First 5 LA’s policy and advocacy efforts, the Board approved the establishment of a strategic partnership with the Silicon Valley Community Foundation (SVCF) to support SCVF’s “Choose Children Campaign” that seeks to ensure that the next governor of California is a champion for children. The partnership presents an opportunity to get “ahead of the curve” by elevating early childhood issues during the campaign among gubernatorial candidates before they are elected to office while also elevating L.A. County-specific needs and priorities that can be addressed by the incoming governor. As a funding partner, First 5 LA staff will play an advisory role in informing policy recommendations that are aligned with First 5 LA’s policy agenda inclusive of ECE, health and home visiting strategies. On any given night, First 5 LA estimates that 3,000 children from ages 0–5 are homeless in L.A. County. More than three times as many — or approximately 11,000 children under 6 years old in the county — are homeless at some point during the year. As a result, most of these children already have experienced or will experience some form of trauma that will affect their overall health and development. According to the report, the traumatic loss of community, possessions, routines, privacy and security for a homeless child can lead to anxiety, depression, withdrawal and aggression at a rate three times higher than children who are not homeless. Homeless families are also more vulnerable to other forms of trauma and adversity, such as sexual assault, witnessing violence or abrupt separation. The impact of homelessness on a child extends to health and academic success: children who do not have a place to call home are sick at twice the rate of other children. Homeless children are also twice as likely to repeat a grade and to be diagnosed with a learning disability. Furthermore, experiencing homelessness as a child can be a risk factor for homelessness later in life. “Homelessness exacerbates childhood exposure to trauma, and childhood trauma can be a contributing factor among adults who experience homelessness. This cyclical relationship between the two is damaging and costly to individuals, agencies and communities,” said report coauthor Dr. Pegah Faed, a Senior Program Officer who leads First 5 LA’s trauma-informed strategy. With the number of homeless family members only escalating — a 29 percent increase countywide between 2016 and 2017 — the report elevates the critical importance of using trauma-informed approaches through the systems of care with which families interact. A family-centered, trauma-informed approach is where a service provider — such as a social worker, shelter administrator or pediatrician — understands what childhood trauma is, recognizes its symptoms in a family and responds by integrating that knowledge into treatment that can set a family and their children on a path to recovery. 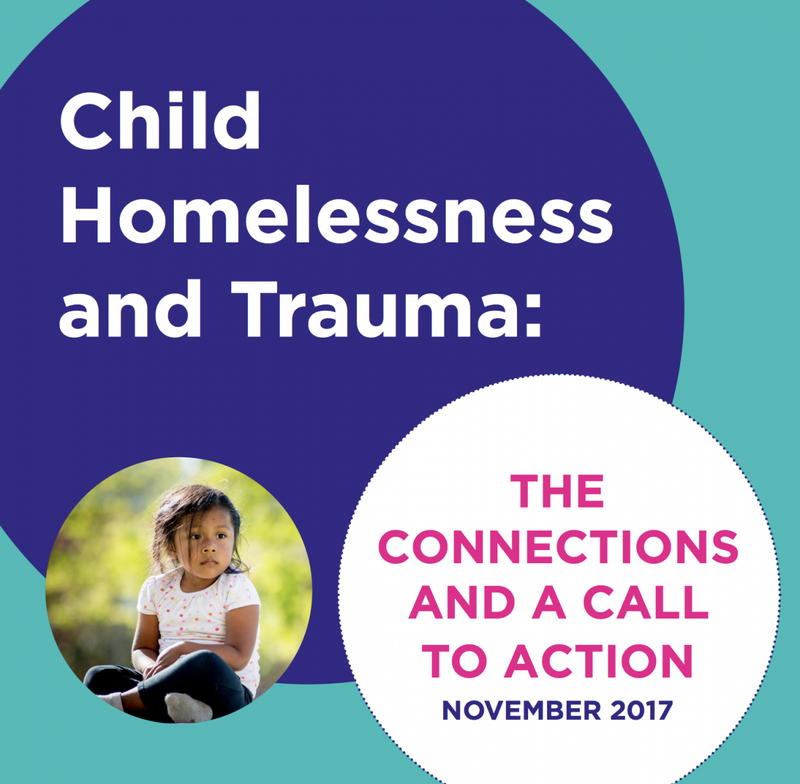 “Understanding the connections of homelessness and trauma is an essential step in informing how these issues can be prevented and successfully addressed by the systems and staff that serve young children and their families ” said report coauthor Dr. Sharon Murphy, Strategic Partnerships Manager at First 5 LA. A similar call to action to address trauma affecting families and children in L.A. County by advancing a comprehensive trauma and resiliency-informed approach was issued by First 5 LA and its partners in October following the release of an extensive report by the Center for Collective Wisdom (C4CW). Joined within a public-private partnership by the California Community Foundation, The California Endowment, The Ralph M. Parsons Foundation and the Conrad N. Hilton Foundation, First 5 LA and its partners are calling for a commitment within organizations and systems to help individuals, families and communities all heal from trauma and strengthen their resiliency. In the report, C4CW conducted an extensive environmental scan of current research and trauma-informed systems change efforts from across the nation. Using the final report recommendations as a guide, the funders and countywide partners will begin to plan and advance specific activities to create a trauma and resiliency-informed county. The full report is available to read here. Meanwhile, First 5 LA continues to elevate the issue of trauma’s impact on young children by working with other organizations, which included cosponsoring “Trauma as a Public Health Issue: The Effects of Trauma on Learning and Workforce Issues” on November 16 in Carson, a collaboration of the Empowerment Congress: Education Subcommittee and the Los Angeles County Office of Education. The event, which featured Vice Dean Marleen Wong of the USC Suzanne Dworak-Peck School of Social Work as the keynote speaker, also included Ficek as a panelist. Taken together, the childhood trauma reports and calls to action, the Policy Agenda and gubernatorial candidate engagement campaign, the HMG-LA partnership and the Antelope Valley Transportation Forum signify a month of milestones in First 5 LA’s evolving strategy to advance policy and systems change required to ensure that children enter kindergarten ready to succeed in school and life. “These milestones are important examples of First 5 LA leading with partnership in service of improving outcomes for children through changes in the systems and supports that influence child well-being,” said First 5 LA Executive Director Kim Belshé. 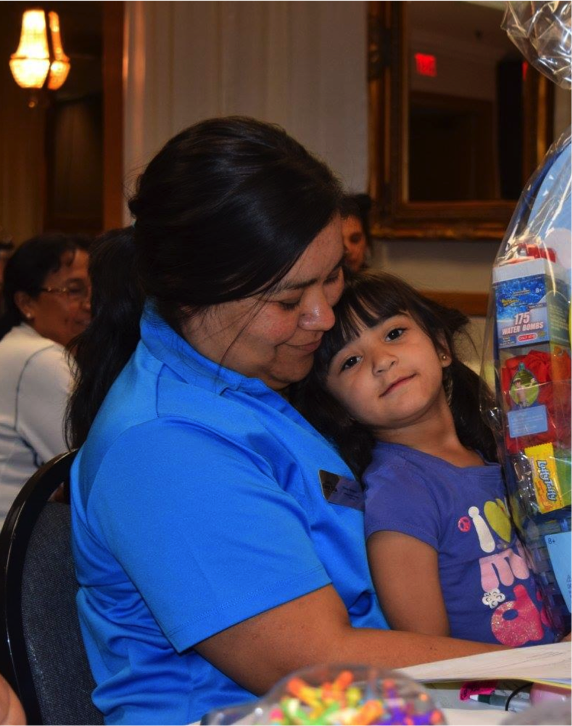 Among all the month’s milestones, Belshé said she was most excited to see parents — who are at the center of systems change — embracing their role as advocates for their families and children at convenings with decision makers like the Antelope Valley Transportation Forum.